ROME — The Vatican announced Wednesday that Pope St. Paul VI’s feast day will be celebrated annually on May 29 as an optional memorial. “A saint is someone who brings divine grace to fruition in what they do, conforming their own life to Christ, Pope Saint Paul VI did this by responding to the call to holiness as a Baptized Christian, as a priest, as a Bishop, and Pope, and he now contemplates the face of God,” Sarah wrote. 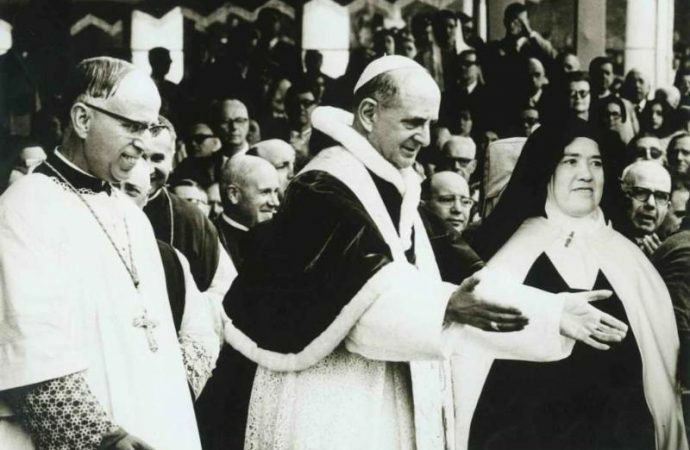 The feast day for canonized saints is typically chosen as the date of their death, or “birth to eternal life,” Sarah explained, but Paul VI died on August 6, 1978, a date which is already celebrated in the Church as the Feast of the Transfiguration of the Lord. 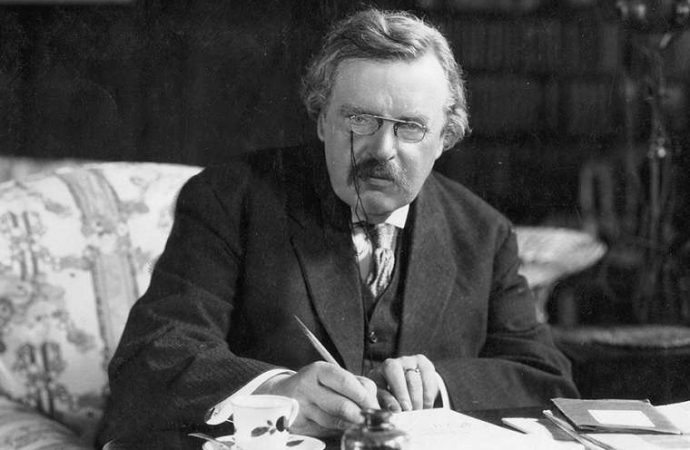 ROME — A leading scholar behind the push to advance the canonization of celebrated writer G.K. Chesterton has published a new book making a case for the sainthood of the “prolific” 20th century author, hitting back at critics who see him as unsuited for a halo. Now that we’ve canonized the Spirit of Vatican II, perhaps we can immediately make Bugnini a Saint? Surely there’s room for Judas, too. This is no time to make it something that’s only for Catholics. Can we canonize a Bugatti instead of Bugnini? But maybe at a baseline, intersectional critical theory focuses on something like the interrelated systems of power that cause vulnerable populations to suffer injustice. Vulnerable populations would include African-Americans, L.G.B.T. persons, the disabled, immigrants and refugees, indigenous peoples, women, etc., and the unjust systems of power often related to those populations — which are racist, homophobic, transphobic, ableist, neo-colonialist, patriarchal, etc. So intersectional critical theory, at a baseline, connects all those together and works at the intersection of those injustices. It's time to suppress the Jesuits again. I've found a new single decade rosary shop. I'll let y'all know. Tigers eye and copper. 10mm. Well, if that isnt a pretty thing.... I'm going to go check out the shop. I can't take a pic of this worth anything. It's beautiful. I was worried about the Our Father bead being blue but, for no reason. 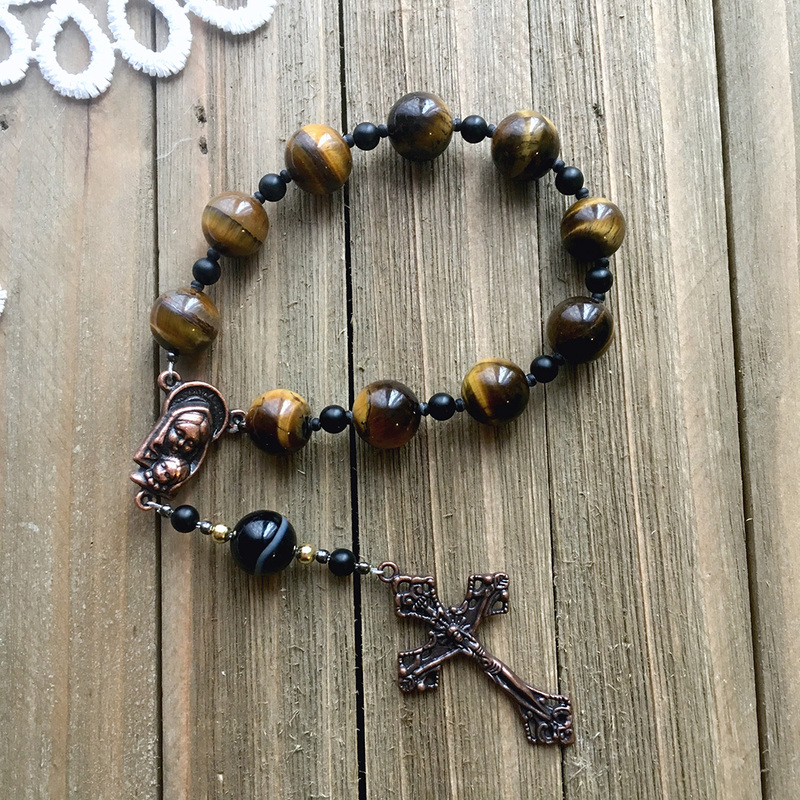 My usual Rosary preference has a little chain slack, this one is tighter. It kinks a little. But, I think it just needs to be blessed and then used to break it in. I say excellent. Forgive my crummy pic skills. That's very handsome. I'm going to have to get a single decade. Is that strung or on a chain? This should generate some useful discussion as the world's bishops meet this week. Nah. Window dressing. His roommate is the new Cardinal Camerlengo. Bishop Wuerl is still running Washington. Cupich is still there. Dolan ate all the sausages off the buffet. And they'll all be talking about pedophilia, not the grooming of sexually mature minors, so you know it's going to really address the problem. I bet they'll come up with zero tolerance. Wuerl and Cupich and Dolan are first world problems. Bishops from Africa and South America will have their say at the council. Francis tagged Cupich to speak at the Vatican Abuse Summit. What the heck is that all about anyway? On the surface, it appears that summit conference this is not going to be about anything. It looks like they are trying to avoid talking about the real elephant in the room: that sub-culture of homosexuality among the clergy and bishops. SACRAMENTO, California — Under California state Democratic Sen. Jerry Hill’s new bill, Catholic priests would be “mandatory reporters” if a person confesses to them they have sexually abused someone. Under current state law, the Child Abuse and Neglect Reporting Act, “makes certain persons, including clergy, mandated reporters.” When clergy and other individuals, like therapists, “within their professional capacity, or within the scope of their employment,” have reason to believe someone is the victim of child abuse or neglect, the law says they are required to report it to the appropriate civil authorities. This law makes an exception if clergy learn of abuse or neglect “during a penitential communication. Hill’s measure, “Removing Clergy Exemption from Child Abuse and Neglect Reporting,” would delete that exception and require clergy to report what they hear in confession as it relates to abuse. 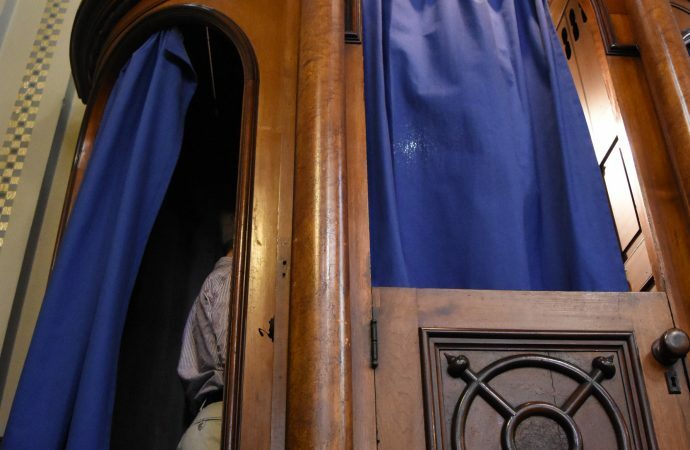 “Inserting government into the confessional does nothing to protect children and everything to erode the fundamental constitutional rights and liberties we enjoy as Americans,” Steve Pehanich, director of communications and advocacy for the California Catholic Conference, told the Los Angeles Times. Paris — The French bishops' conference has condemned rising anti-Semitism in the country, as official data showed a massive increase of attacks, prompting new government measures. The conference president, Archbishop Georges Pontier of Marseille, wrote France's chief rabbi, Haim Korsia, Feb. 20. "Attacks from seemingly religious motives on our fellow citizens are unacceptable; we stand beside you in struggling against every manifestation of hatred," Pontier said in his letter. "Our society cannot find peace unless it supports a constructive dialogue among all its members. May we never resign ourselves to the growth of intolerance and rejection," he said. In Paris Feb. 19, some 20,000 people rallied against anti-Semitism, prompting President Emmanuel Macron to announce new measures against extremism. Msgr. Olivier Dumas, conference secretary-general, called on all political parties and faith groups to "show solidarity with Jews" and condemn attacks on religious targets. "This climate of violence and hatred must end," he told Vatican Radio. "We must wage a struggle against anti-Semitism with fierce determination, knowing where hatred of Jews led in our history, and do everything to ensure powerful impulses for such unimaginable violence never arise again." He said fighting anti-Semitism was a responsibility "not just for institutions and religious leaders, but for all French citizens," who should mobilize through education and "a permanent re-reading of history." In a separate Feb. 18 statement, the bishops' conference pledged "seamless support for the Jewish community," and recalled Pope Francis' call for "joint work to ensure anti-Semitism is banished from the human community." It added that France's Christian churches had also witnessed "numerous acts of vandalism and profanation," and said "signs of hatred in the heart of society" called for "a leap of fraternity."